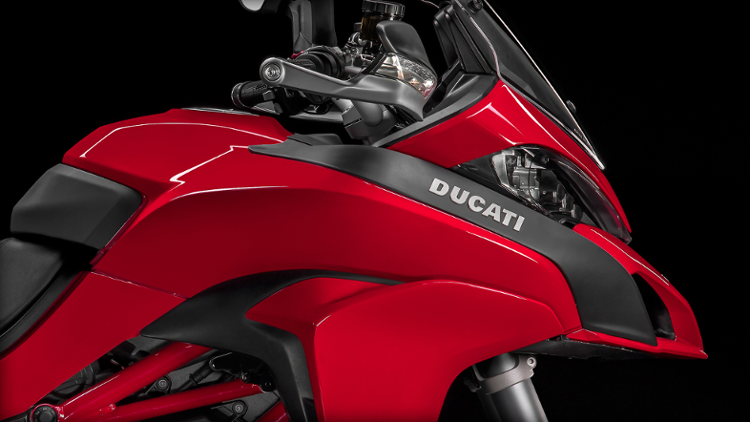 Cutting-edge safety technologies make the Multistrada 1200 S Touring D|air® the first motorcycle incorporating an intelligent system wirelessly connected with the airbags inside the special Ducati D|air® apparel by Dainese. 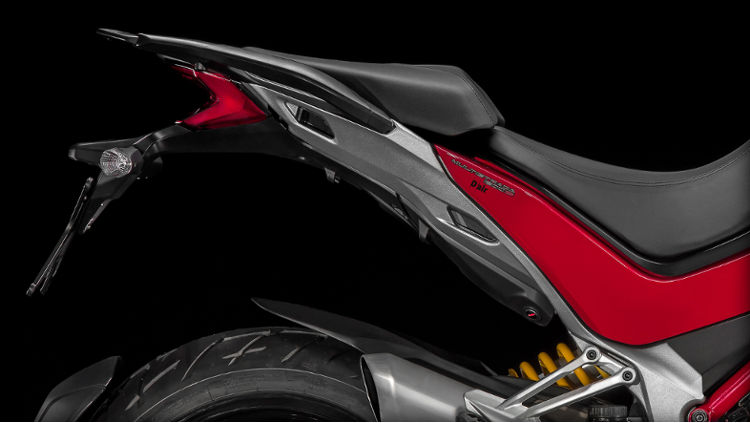 Made to inflate in just 45 milliseconds, the D|air® System will protect the vital organs of both rider and passenger aboard the Ducati Multistrada 1200 S.
The MTS 1200 S D|Air is available in Red. 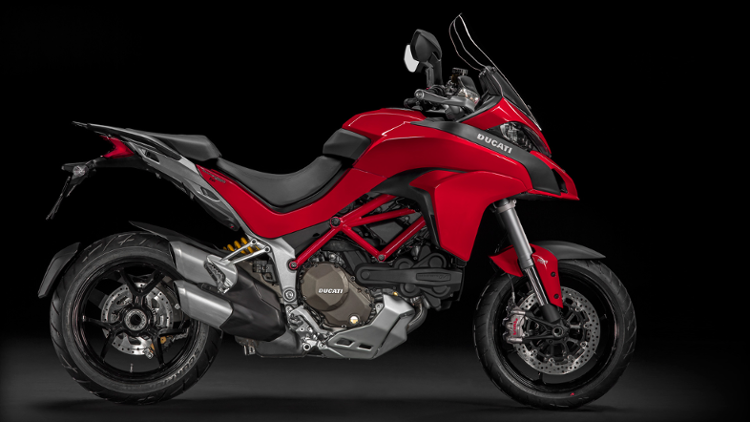 The Multistrada 1200 S is powered by the brand-new revolutionary Ducati Testastretta DVT engine which adopts a Desmodromic continuous variable valve timing to optimize power and torque across a wider rpm band delivering an unprecedented combination of breath-taking-torque (132 [email protected] rpm), class-leading power (160 [email protected] rpm) , super-smoothness and low fuel consumption; the Desmodromic Variable Timing (DVT) is a double and continuous system applied for the first time to a motorcycle engine managing both exhaust and intake camshafts. The system installed on the new Multistrada 1200 offers a very smooth intervention of the system, which gives priority to ignition delay. In case of wheel-spin, the system reacts by delaying the ignition, up to a 60% torque reduction request. For higher torque reduction requests the injection is cut off. 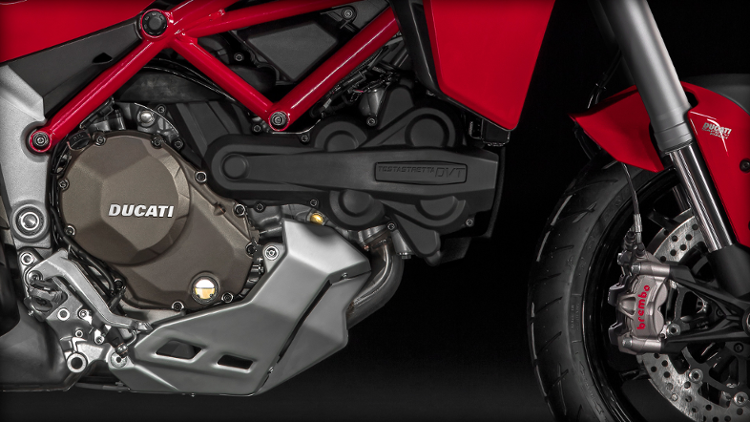 The Multistrada 1200 S features a Superbike spec Brembo braking system composed by racing oriented PR 16 brake pump managing two Ø 330 mm front discs coupled with Superbike-spec Brembo Monobloc M50 calipers. The rear performs with an huge single Æ 265 mm disc gripped by a single 2 x 28 floating Brembo caliper with sintered pads. D|air Street® is an innovative system for motorcyclists' safety, designed for road use and composed of two separate modules: a unit comprising sensors and electronic components integrated into the on-board electronics of the Multistrada 1200 S D|air, and an airbag module fitted in the Ducati D|air Street® Jacket/Vest, available for rider and passenger. In case of a dangerous situation, on-board electronics wirelessly control the inflating of the airbag to cover those body parts most exposed to impact: back, collarbones, thorax. D|air Street® clothing must be purchased separately from the bike.